Ever get a mouthful of smog? In big cities, people breathe it every day. 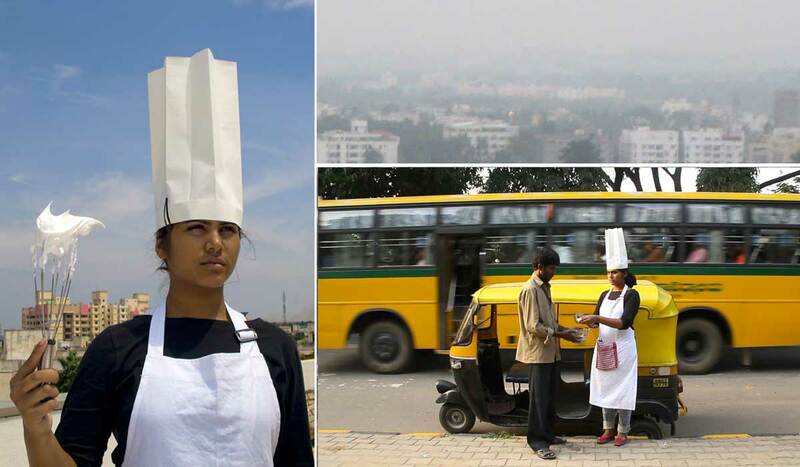 The Smog project by The Center for Genomic Gastronomy explores the taste of smog – by whipping up egg foams in cities with lots of smog, like Bangalore. Why egg foams? Egg foams are 90% air – so in making an egg white, you can actually capture the quality of the air in the taste. The project is a combination of scientific study and conceptual art, and has been done by Zackery Denfeld and Cathrine Kramer, with seven other students of the Center for Genomic Gastormony. The team was researching biosensors, plants and animals in nature that indicate the state of the environment in their natural state. Densfeld and Kramer wondered if they could test for outdoor air quality by whipping egg whites and capturing some of the air and found that by asking others to eat something made with smog created a strong reaction by others. Smog is difficult to see, and the damage it causes takes a long time to show. For the project, Densfeld, Kramer, and the students from the Center headed out to different parts of Bangalore with whisks, and made meringues from the batter that came back. Then next offered free samples to visitors, telling them about where they were made, and with what smog. Can you taste smog? Could you send sweet egg white smog treats to politicians, business owners, and others to draw attention to air pollution issues? The team is planning to explore this – and to continue to generate dialogue about smog and air quality. The project was part of the “Edible” exhibit at the Science Gallery at Dublin’s Trinity College earlier this year. Want to test your air quality? Whip up a batch of merengues out on the street – and see what you think after eating it.